Sometimes one's senses don't cooperate during a tasting. Sometimes one gets a bad sample. Sometimes the whisk(e)y was stored improperly or has been sitting at the bottom of a mostly empty bottle for years. These variables often result in a less than optimal set of tasting notes. There have been times that I've tasted something and went "What?" Then I compare my notes to those of others who have tried the same drink......and it's as if we've tasted completely different whiskies. Though the tasting experience is subjective, if I try a dram of Glen Garbage and discover notes of rotten milk and mercury while everyone else finds characteristics of dried fruits, chocolate, and mint, it's fair to say that I've experienced some level of a whiskey fail. I feel like I'm mostly alone in my judgement of Hakushu 12yr. I really wanted to love it, almost bought a bottle of it blind. All the tasting notes I'd read online sounded quite nice. But instead of nosing and tasting hints of citrus, lemongrass, licorice, vanilla, pepper, and flowers, what did I find? Salty-beefy-cheesy farts. And per my notes: "a watered-down Laphroaig 10 meets Glenfiddich 12 infused with a kitchen gas leak." So there was a fail in there somewhere. Maybe it was the sample. Maybe it was me......or rather my senses -- I did not smell like salty-beefy-cheesy farts, I think. I'm humbly posting two reports this week that I believe were examples of whisk(e)y fails. Today, it's Irish, tomorrow it's Scottish. 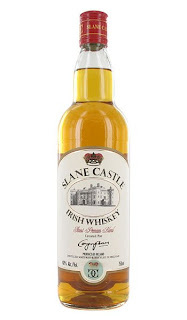 Slane Castle is one of the several indie bottlings produced at Cooley Distillery. With the recent Beam Inc. takeover, all or most of these indies will stop production as the new owners want to keep as much juice as possible for their major brands (Kilbeggan, Tyrconnell, and Connemara). At the moment, Slane Castle is still for sale all over the US and their website is still active. Drinkhacker liked it quite a bit. John Hansell of Whisky Advocate wrote a pair of very positive reviews for this whiskey. He noted that it was full of "honeyed vanilla, soothing caramel, lively summer fruits, golden raisin, subtle date, and butter cookie" and that it was very drinkable. Sounds yummy, right? Especially for this blogger who loves him some Irish whiskey. Finish -- hay & manure, zoo-ey, old moldy basement, Please will it ever stop? Where are those butter cookies? Lively summer fruits? I'm a firm believer that a plastic toy or manure note can actually work well in a whisk(e)y or wine. But whatever was going on here was just funk when integrated with my nostrils and tastebuds. Looking at other reviewers' notes, it seems like we'd tried different booze. They spoke of pleasurable drinking experiences and I (who have had more Irish whiskey than I can ever quantify) found the worst Irish porta-potty distillate I've yet tried. Was it just me? I don't know. I'd had a Powers 12yr an hour earlier and that tasted fine. Could the Slane bottle have been sitting open on the shelf since the whiskey arrived on US shores in July '09? Possibly. Either way, something went awry.